Long and flat. Should be very few curls. The color should be rich chestnut, without a trace of black. White markings are common. 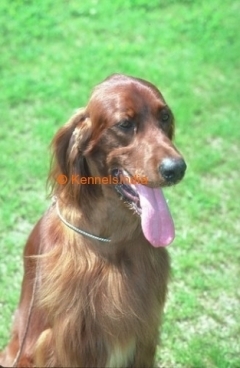 There is a red-white Irish Setter that is mostly white with red markings. This dog is lively, energetic, playful, and independent. Barking is infrequent. This dog gets along well with children, other dogs, and any household pets, and will enthusiastically welcome visitors. Irish Setters must be trimmed occasionally. Excess hair between the pads of the feet and under the ears must also be trimmed. Irish Setters take to training well. Handlers must be consistent in approach. It may be necessary to take the dog to a puppy training couirse. Young Irish Setters need to be trained when young to return when you call them. This breed needs plenty of exercise, so long walks are required.